PERRY, Oklahoma- E-Z Drill’s pneumatic, 210 3-parapet wall drill maximizes productivity while drilling vertical holes for a variety of concrete applications, such as securing temporary protective walls along shoulders of bridges and roadways; anchoring temporary traffic barriers; and unique applications, such as maintaining concrete seawalls. The 3- parapet wall drill ensures continuous operations and optimal uptime with its innovative features. E-Z Drill’s patented roller-bearing feed system powers each drill automatically with individually tailored air pressure according to the material it is used on. This extends the service life of the drill bit because it helps prevent the bit from bouncing against the concrete due to inadequate pressure. The multi-point oil injection system reduces wear on the drill motors by ensuring each drill motor has enough lubricating oil from its single reservoir. This is more effective than a central oiling system, which doesn’t offer individual lubrication points. Quickrelease bit guides can accommodate several bit styles, including one-piece whirl bits, two-piece H-thread bits and taper steel bits. The bit guides also allows the operator to replace bits quickly, which contributes to minimal downtime. The drill adjusts easily to meet a variety of project specifications. The units can drill holes up to 2-1/2 inches in diameter and as deep as 3 1/2 feet to accommodate the height of parapet wall sections. The 4-foot-long spacing between each drill gang is fully adjustable, allowing the operator to tackle a range of drilling intervals. And, the drill requires a minimum airflow of 300 cubic-feet per-minute to operate all three drill motors. 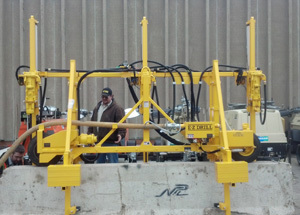 For simple maneuverability, the 3-gang parapet wall drill is self-propelled, so the operator can use a lever to move it along the parapet wall rather than manually pushing it. The drill’s two pneumatic wheels support the unit’s quick repositioning capabilities, which eliminates the tedious and time-consuming process of manually leveling and repositioning it after each movement. The two vertical arms secure the drill to the parapet wall and the wheels attached to the arms allow it to move freely. The drill also maximizes productivity with its easy-to-use control panel. The panel is detachable and can be mounted on either side of the drill so operators achieve superior visibility of the worksite. The simple, grouped controls provide efficient operations so users can focus on drilling and their surroundings, which improve workflow and safety. An optional dust collection system can be attached to the drill for additional safety on the worksite. By using the dust collection system, operators’ dust exposure is reduced dramatically and it protects the environment and prevents dust from blowing into nearby traffic. The system extends the life of the E-Z Drill units by removing dust that can stick to lubricants or wear nuts and bolts. E-Z Drill offers contractors equipment for concrete drilling and doweling that are faster, more accurate and safer than handheld rock drills. The company was established in 1987 and manufactures slab rider, on-grade and equipment-mounted drills with up to five gangs as well as vertical utility models and concrete drilling accessories, such as dust-collection systems. E-Z Drill also can custom design and build automatic drill systems for specific jobs.